Pantograms looked long and hard at the heat presses that are available in the market before we started offering the Hotronix line of products. We looked hard because the right heat press is at the core of a successful custom products business, and our customers are going to rely that heat press to deliver their orders on time, every time. Varying temperatures across the surface of a heat press can be one of the most insidious problems in the custom t-shirt business. If you’re using our OKI920WT white toner printer, for example, those t shirt transfers it produces need to be married properly and then pressed evenly onto the substrate of your choice. Uneven heating can cause one part of the transfer to peel, wash off or just never set properly. Can you imagine delivering an order and having a customer complain because the image washed out? Or finish your 50th shirt and realize that one corner is peeling up on all of your designs? Patches, heat transfers or t shirt transfers, rhinestone transfers, mugs, caps, are all things you can make real money within the custom apparel industry. When you’re pressing transfers for 6-10 hours in a day, 5 day a week it will put some real strain on your heat press. That’s why we stressed the COMMERCIAL quality of the press. You WILL get big orders and you need a press that’s not built for part time hobbiests, but for real industrial applications. We chose the Hotronix Fusion for our demonstration room because we run it all day and can’t make a mistake just like you. 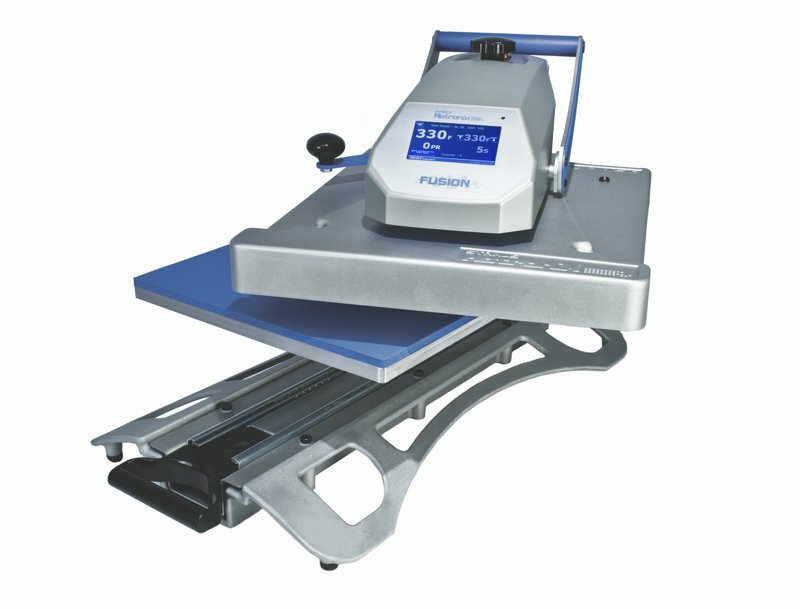 There are a wide variety of heat press models available and each has their own advantages or specific application. We chose the Hotronix Fusion model for our production and demonstration, and to include it with our Stitch & Print products not just because of the quality construction and consistent temperatures, but because of its versatile design as well. The right size – the 16” x 20” press area is perfect for use with t shirt transfers produced by the OKI920WT T Shirt Printing Machine, but also is right for patches, rhinestone transfers, screen printed transfers and more. Threadability – that means you don’t have to bunch up thick sweatshirts, XXL tees or athletic wear. You can put them on the press like you would on a hangar with one side under the pressing are and one side below. Safety-first Draw Press – a “draw press” means that the pressing area that the t shirt, for example, is threaded onto, pulls out like a drawer leaving the hot shell top (like an iron) where it is. This is as opposed to a “clam shell” design that actually has you reach under the heat to get your garment. Swing Away Too – Every shop design is different and a commercial heat press takes up space, so it’s important that it’s flexible. The Hotronix Fusion will either operate in draw press mode, described above, OR as a “swing away” press. In swing away mode, rather than the pressing are sliding straight out has the hot part, the head, swing out of the way. Have you designed your apparel decorating space yet? If not, the Fusion is perfect because of it’s versatility. Call us toll free 1 (800) 872-1555 to learn more about heat presses.